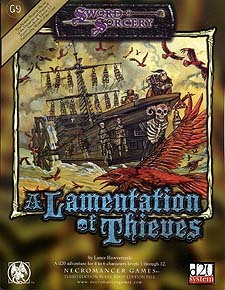 A Lamentation of Thieves is a collection of six adventures for characters of levels 1 to 12, each episode revealing a new and challenging region of Hawkmoon's geography and drawing the characters deeper into the private war between two ancient enemies. From the nightmares of the Bonegarden to the decks of a doomed prison barge, the danger intensifies like a storm, at the center of which is a horrible secret, and a certain band of heroes. Contains new spells, feats, monsters, magic items, and martial arts.